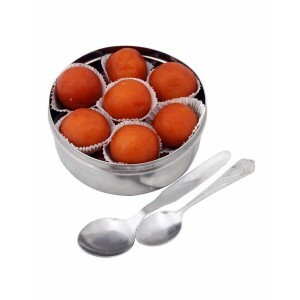 Gulabjamun, or gulaabjamun, is a milk-solids-based sweet or mithai, popular in countries of south Asia, in particular India, Sri Lanka, Nepal, Pakistan and Bangladesh. It is made mainly from milk solids, traditionally from freshly curdled milk. It is often garnished with dried nuts like almonds to enhance flavor according to Middle Eastern tradition.In India, milk solids are prepared by heating milk over a low flame for a long time until most of the water content has evaporated. 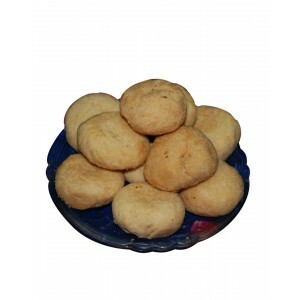 These milk solids, known as Khoyain India and Pakistan, are kneaded into dough, sometimes with a pinch of flour, and then shaped into small balls and deep-fried at a low temperature of about 148 °C. 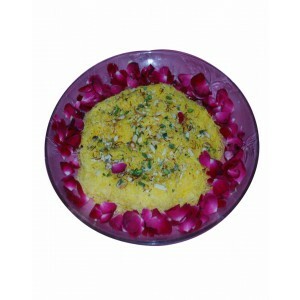 The balls are then soaked in light sugary syrup flavored with green cardamom and rose water. Gulabjamun is available commercially, at South Asian restaurants or pre-prepared either in tins or as kits to be prepared at home. Gulabjamun was first prepared in Medieval India, derived from a Fitter that Persian speaking invaders brought to India. The word "gulab" is derived from the Persian words gol (flower) and āb (water), referring to the rose water-scented syrup. "Jamun" or "jaman" is the Hindi word for Syzgium Jambolanum, an Indian fruit with a similar size and shape. 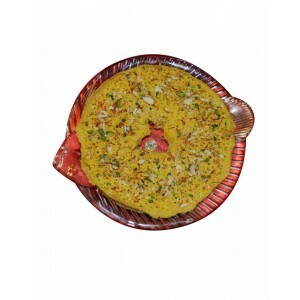 The Arab dessert luqmat al-qadi similar to gulabjamun, although it uses a completely different batter. According to the culinary historian Michael Krondl, both luqmat al-qadi and gulabjamun may have derived from a persian dish, with rose water syrup being a common connection between the two. Gulabjamun is often eaten at festivals, birthdays or major celebrations such as marriages, the Muslim celebrations ofEid, and the Hindu festival of Diwali (the Indian festival of light), holi and many others. 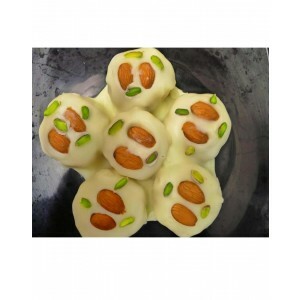 There are various types of gulabjamun and every variety has a distinct taste and appearance. Gulabjamun gets its brownish red color because of the sugar content in the milk powder. In other types of gulabjamun, sugar is added in the batter, and after frying, the sugar caramelisation gives it its dark, almost black color, which is then called kala jam or "black jam". The sugar syrup may be replaced with (slightly) diluted Maple Syrup for a gulabjamun with a Canadian flavor. Homemade gulabjamun is usually made up of powdered milk, a pinch of all-purpose flour (optional), baking powder and clarified butter; kneaded to form a dough, molded into balls, deep fried and dropped into simmering sugar syrup. You can relish this favorite sweet and satisfy that sweet tooth on wishvilla.com, as we bring to you your favorite sweet the Gulab Jamun, at your doorstep. So hop on to your computers and log in to wishvilla and order from our wide variety of sweets and snacks made by famous sweat meat merchants of the nation. 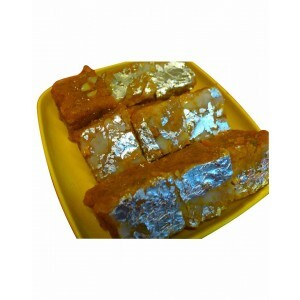 Don’t deprive yourself of this yummy sweet and order from us.